In January, we began our new series on Cloud Computing by documenting how to build an awesome LAMP server in the Cloud using Linux. Today we’re again going to show you how to use the same Cloud platform and take advantage of the $10.50 coupon code TAKE70 to build an Incredible PBX in the Cloud FOR LIFE. When you’re finished, you’ll have a state-of-the-art Incredible PBX 13 server with hundreds of PBX features including free calling to the U.S. and Canada using any (free) Google Voice account. Keep in mind this isn’t $10.50 a month for your cloud server. It’s $10.50, period! The whole project takes less than an hour. Before we begin, let’s revisit our cautionary note for those that missed it in the previous article. It’s important. There’s lots to hate at Cloud At Cost, a Canadian provider that offers virtual machines in the cloud for a one-time fee with no recurring charges. For $35 $10.50, you get a virtual machine with 512MB of RAM, 10GB of storage, and a gigabit Internet connection FOR LIFE. We haven’t seen a week go by when Cloud at Cost didn’t offer some sort of discount. Today it’s 70% which brings the total cost down to $10.50. That’s less than a burger at Five Guys. That’s the good news. But, if security, 99.999% reliability, performance, and excellent customer support are your must-haves, then look elsewhere. So why would anyone in their right mind sign up for a cloud solution that didn’t offer those four things? Did we mention it’s $10.50 for a lifetime cloud server? If you take our recommendation and plunk down your $10.50, you’ll need to go into this with the right attitude. It’s not going to be flawless perfection computing. It’s a sandbox on which to experiment with [VoIP] and Cloud Computing. Will your virtual machine disintegrate at some juncture? Probably. Our experience is that the first couple days are critical. If you start seeing sluggish performance which degenerates to zero, don’t waste your time. Take good notes as you go along, delete the virtual machine, and rebuild a new one. It won’t cost you a dime, and it’ll save you hours of frustration. We suspect that bad folks get onto some of the servers and delight in bringing the machines to their knees. So the quicker you cut your losses, the better off you will be. Is CloudAtCost a good solution for production use? Absolutely Probably not so don’t try to fit a square peg in the round hole. It’s not gonna work, and you WILL be disappointed. Today’s experiment will give you a platform on which to learn before you decide upon a more permanent deployment solution. And it will give you a terrific home for a backup server once you do move to a long-term solution so your $10.50 won’t be wasted. The objective today is to show you how to build a rock-solid, secure VoIP server in the Cloud with all the bells and whistles you’d typically find on a PBX costing tens of thousands of dollars. Incredible PBX is pure GPL, open source code with one major difference. It’s FREE! And it’s supported by thousands of users on the PIAF Forum that started just like you. For long time readers of Nerd Vittles, you already know that the component we continually stress is security. Without that, the rest really doesn’t matter. You’ll be building a platform for someone else to hijack and use for nefarious purposes. When we’re finished today, you’ll have a cloud-based VoIP server that is totally invisible to the rest of the world except a short list of VoIP providers that have been thoroughly vetted by Nerd Vittles staff. You can whitelist additional locations and phones to meet your individual needs without worrying about your server being compromised. To get started, you’ve got to cough up your $10.50 at Cloud at Cost using coupon code TAKE70. Once you’ve signed up, CloudAtCost will send you credentials to log into the Cloud at Cost Management Portal. Change your portal password IMMEDIATELY after logging in. Just go to SETTINGS and follow your nose. HINT: DC2 is the preferred data center! To create your virtual machine, click on the CLOUDPRO button and click Add New Server. 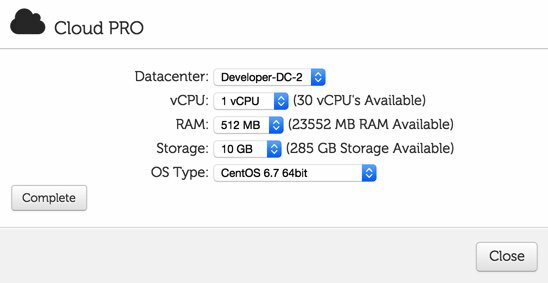 If you’ve only purchased the $10.50 CloudPRO 1 platform, then you’ll need all of the available resources shown in the pick list. Leave CentOS 6.7 64bit selected as the OS Type and click Complete. Depending upon the type of special pricing that Cloud at Cost is offering when you sign up, the time to build your virtual machine can take anywhere from a minute to the better part of a day. Things have settled down since the 90% off week so new servers typically are ready in a few minutes. However, we’ve learned to build new virtual machines at night where possible. Then they’re usually available for use by the next morning. Luckily, this slow performance does not impact existing virtual machines that already are running in the CloudAtCost hosting facilities. With a little luck, your virtual machine soon will appear in your Cloud at Cost Management Portal and look something like what’s shown above. The red arrow points to the i button you’ll need to click to decipher the password for your new virtual machine. You’ll need both your IP address and the password for the new virtual machine in order to log into the server which is now up and running with a barebones CentOS 6.7 operating system. Note the yellow caution flag. That’s telling you that Cloud at Cost will automatically shut down your server in a week to save (them) computing resources. You can change the setting to keep your server running 24/7. Click Modify, Change Run Mode, and select Normal – Leave Powered On. Click Continue and OK to save your new settings. Finally, you’ll want to change the Host Name for your server to something more descriptive than c7…cloudpro.92… Click the Modify button again and click Rename Server to change it. 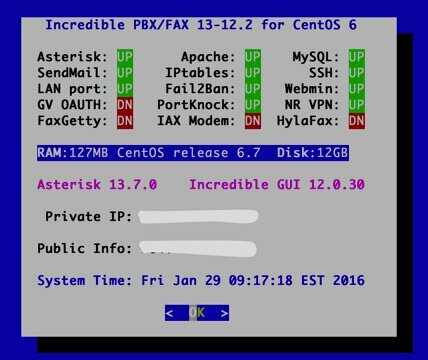 IncrediblePBX13 has a nice ring to it, but to each his own. Next, let’s address a couple of CloudAtCost quirks that may cause problems down the road. CloudAtCost has a nasty habit of not cleaning up after itself with fresh installs. The net result is your root password may get reset every time you reboot even though you changed it. When the install begins, read the license agreement and press ENTER to agree to the terms and get things rolling. Now would be a great time to go have breakfast or lunch. Come back in about an hour and your server should be ready to go. 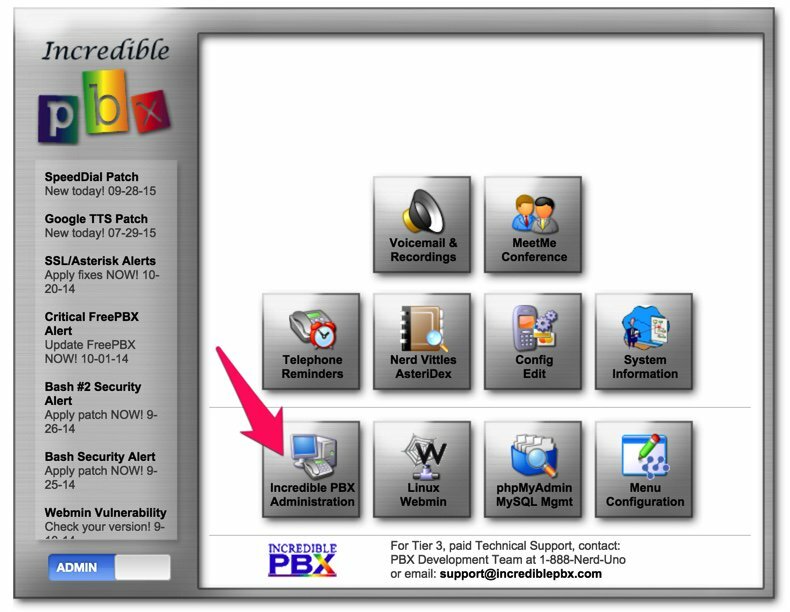 Unlike some other PBX offerings that leave your server exposed to the Internet, Incredible PBX is different. Unless the IP address from which you are accessing the server has been whitelisted, nobody on the Internet can see your server. The only exception is the preferred providers list and those on the same local area network (which is nobody in the case of CloudAtCost). As part of the Incredible PBX install, the IP address of the computer you used to perform the install was whitelisted automatically. But there may be other computers from which you wish to allow access to the PBX in order to deploy telephones at remote sites. Some of these sites may have dynamic IP addresses that change from time to time. Or you may have traveling salesman that land in a new hotel almost every night with a new IP address. Fortunately, there are a number of free and paid Dynamic DNS providers. For sites with dynamic IP addresses, simply choose a fully-qualified domain name (FQDN) to identify each location where you need computer access or need to deploy a phone. Then run a dynamic DNS update utility periodically from a computer or router at that site. It reports back the current public IP address of the site and your DNS provider updates the IP address assigned to that FQDN whenever there are changes. DNS update clients are available for Windows, Mac OS X, and many residential routers. They’re also available for Android devices. Then it’s just a matter of plugging in the remote users’ FQDNs so Incredible PBX knows to give them server access via the whitelist. You implement this in seconds using the add-ip and add-fqdn utilities in the /root directory. There are other ways to gain access as well using the PortKnocker utility or Travelin’ Man 4 from a telephone. Both of these are covered in the Incredible PBX 13 tutorial so we won’t repeat it here. First, let’s check things out and make sure everything is working as it should. With your favorite web browser, visit the IP address of your new server. 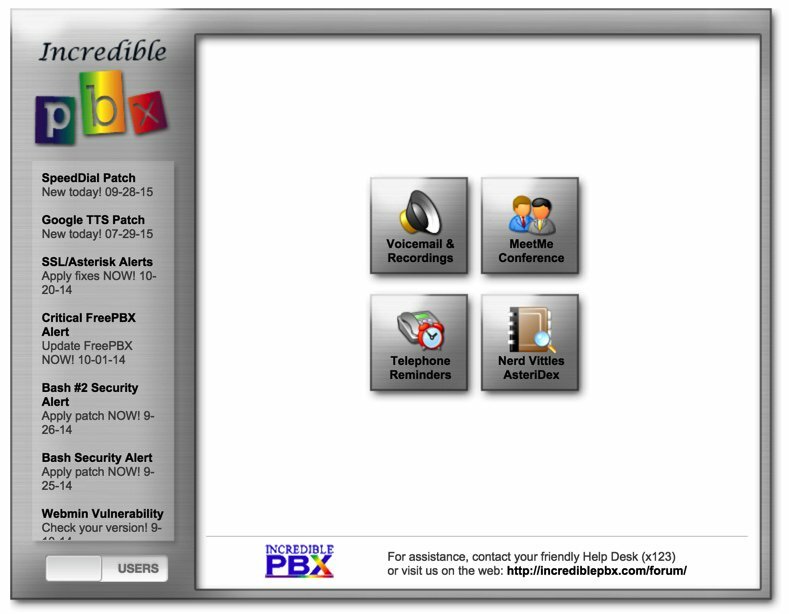 You should see the default Incredible PBX page, the Kennonsoft Menu. It’s divided into two parts, a Users tab (shown below) and an Admin tab with additional options that we’ll cover shortly. Now we need to jump back to SSH or Putty and log back into your server as root. You’ll note that the Incredible PBX Automatic Update Utility is run each time you log in. This is how important security updates are pushed to your server so do it regularly. And, no, you don’t need to contribute to our open source projects unless you want to. You’ll still get the updates as they are released. After the Automatic Update Utility runs, the login script will execute status which tells you everything you need to know about the health of your server. After the initial install, it will look something like this with your server’s IP address obviously. We’ll cover the RED items down the road a bit. For now, we need to complete a few preliminary setup steps for Incredible PBX to make sure you can log into the various components which have been installed on your computer. There are several different credentials you will need. Most of these are configured using scripts in the /root folder of your server. First, you need your root password for the server itself, and you should have already set that up with a very secure password using passwd. These same credentials are used to login to WebMin. Next you’ll need an admin password for the Incredible PBX GUI. This is the management utility and Asterisk® code generator which consists of FreePBX® GPL modules that are open source and free to use. The admin password is set by running admin-pw-change in the /root directory. There are also a number of web-based applications such as Telephone Reminders, AsteriDex, phpMyAdmin, and VoiceMail & Recordings (User Control Panel). You obviously don’t want everyone with a telephone using all of these applications so they are protected using a couple different Apache web server credentials. First, you set up an admin password for the administrator-level applications using the htpasswd utility. Then you set up an end-user account and password for access to AsteriDex, Reminders, and the User Control Panel. With the User Control Panel, end users also will need a username and password for their particular phone extension and this is configured with the Incredible PBX GUI using Admin -> User Management -> Add New User. If this sounds convoluted, it’s really not. Apache credentials can be entered once in an administrator’s or end user’s browser and they’re stored permanently. Incredible PBX also includes an optional (and free) faxing component that lets you send and receive faxes that are delivered to your email address. To activate Incredible Fax, run the following script and plug in your email address for delivery of incoming faxes: /root/incrediblefax11.sh. After entering your email address, you’ll be prompted for all sorts of additional information. Unless you have unusual requirements, pressing the ENTER key at every prompt is the appropriate response. You’ll need to reboot your server again when the fax installation is complete. Once you log back into your server as root, the bottom line of the status display should now be green UP entries. If you’re new to Asterisk and FreePBX, here’s the one paragraph primer on what needs to happen before you can make free calls with Google Voice. You’ll obviously need a free Google Voice account. This gets you a phone number for people to call you and a vehicle to place calls to plain old telephones throughout the U.S. and Canada at no cost. You’ll also need a softphone or SIP phone (NOT a regular POTS telephone) to actually place and receive calls. YATE makes a free softphone for PCs, Macs, and Linux machines so download your favorite and install it on your desktop. Phones connect to extensions to work with Incredible PBX. Extensions talk to trunks (like Google Voice) to make and receive calls. We use outbound routes to direct outgoing calls from extensions to trunks, and we use inbound routes to route incoming calls from trunks to extensions to make your phones ring. In a nutshell, that’s how a PBX works. There are lots of bells and whistles that you can explore down the road. As configured after installation, you have everything you’ll need except a Google Voice trunk, and we’ll cover that next. Then we’ll add a softphone with your extension 701 credentials, and you’ll be ready to make and receive calls. Before we move on, let’s decipher your extension 701 password so that you’ll have it for later. Choose Applications -> Extensions -> 701 and scroll down the screen to the Secret field and write down your password. You can also change it if you like and click Submit and then the Red button to update your settings. While you’re here, write down your extension 701 Voicemail Password. That leaves one RED entry on your status display, GV OAUTH. Whether to use plain text passwords or OAUTH 2 credentials with Google Voice accounts presently is a matter of choice although Google regularly threatens to discontinue access to Google Voice without OAUTH authentication. We suggest you play with Google Voice using plain text passwords just to get your feet wet because OAUTH implementation gets complicated. When you get ready to deploy a permanent Incredible PBX server, that would be the appropriate time to switch to OAUTH. This tutorial (beginning at step 1b) will guide you through the process. Sixth, save your settings by clicking Submit and the Red Button to reload the GUI. Finally, using SSH or Putty, log into your server as root and restart Asterisk: amportal restart. Now you’re ready to set up a telephone so that you can play with Incredible PBX. We recommend YateClient which is free. Download it from here. Run YateClient once you’ve installed it and enter the credentials for the 701 extension on Incredible PBX. You’ll need the IP address of your server plus your extension 701 password. Choose Settings -> Accounts and click the New button. Fill in the blanks using the IP address of your server, 701 for your account name, and your extension 701 password. Click OK.
Jeez, every time you say Cloud@Cost a kitten dies. Literally the worse service I’ve used since 2002 era Sprint. After the second time in a month that my VPS was completely inaccessible with no help from support I turned it into a Folding at Home server, maxing out resource usage. I make sure it’s running at 100%, reimaging it every few weeks (often sooner because the service really is abysmally unreliable). I really wish I hadn’t given them money, as a real VPS provider is such a tiny amount per month for an actually usable server. I really don’t see how using C@C would even be good as a sandbox, as you have sometimes days before your server is completely unusable again.